Tire pressure plays an important but often underrated role in safe driving. Tires that are maintained at the correct pressure will be more responsive to driver input and more resilient to damage. They will also be more fuel efficient and longer lasting, so it really does pay to monitor your tire pressure and top up with air when necessary. 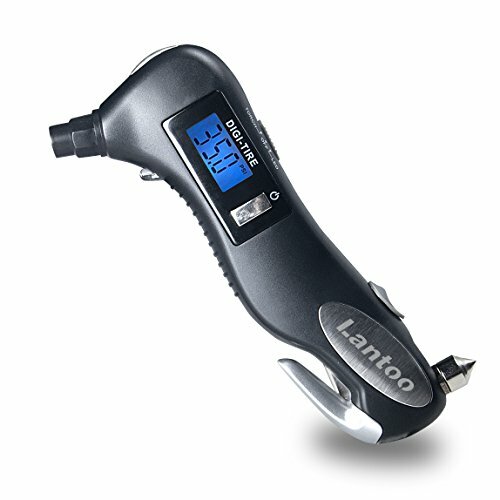 For easy and efficient monitoring, a tire pressure gauge is a convenient tool to have. 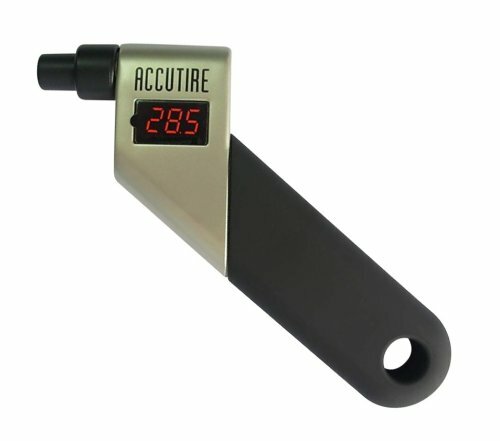 These days many people prefer digital gauges since they can often be easier to read and simpler to use. With so many models on the market, we’ve put together this buying guide to comb through all the options and present you with five contenders for the best digital tire pressure gauge of 2018. As pressure gauges can be quite simple devices, some manufacturers take this is as a challenge to attach extra tools to them in order to increase their functionality. That is the case with our first item, a pressure gauge from AUTMOR that has other uses. Adding a load of extra gadgets to pressure gauges can backfire, but this unit broadly works mainly because some thought has been given to which tools are included. The included glass hammer is a very useful tool that all cars should carry for emergencies while the tire tread measuring device is also very useful. Pressure and tread depth are two things that must be monitored in order to ensure tires operate safely, so it’s great to see both can be done with one tool. Additionally, the display is large and bright while the tool itself is small and easy to store. It’s a shame though that there are no built-in light sources such as a lighted nozzle, but that’s just a small complaint. One thing that did bemuse us slightly is that nowhere does AUTMOR actually state what the measuring range of the device is. We assume it’s 0 to 60 or 100 PSI as it is the standard, but it would have been nice to have that stated somewhere! Compared to the model we looked at above, this offering from Accutire is a far simpler device. Instead of being weighed down by bells and whistles, its simplicity is actually its biggest selling point. To use, just push the tire valve into the machine, and it comes to life, giving a quick and very accurate reading of tire pressure. The pressure is displayed on the bright red on a black screen, and that’s it. Although very simple, the device itself is very tough because it has a metal body construction and a rubber handle. That means that this device is a bit bigger than many other models. This is a basic device in other ways too. It cannot measure below five PSI, for example, and it only gives a reading for PSI, which means no other measurements are possible. This product from Tekton is a far more involved little tool. It brims with useful features and intelligent design. But is it too smart for its own good? There is a lot to like about this device from Tekton. It has been designed to be as ergonomic as possible and will feel very comfortable in the hand. It’s also very small and light which again makes it easy to hold and easy to store. There are a lot of very useful design features too. The light-up nozzle is very bright and helps to connect the device while the screen is not the biggest but is bright enough to be seen easily. It can provide four different measurements of the pressure in your tires, from standard PSI to BAR. That is very useful but is a symptom of the negatives of this device as it makes it a little too complicated. To switch through the different measuring styles, for example, you press the single button. But you also turn the device on by pressing that button. So, you have to press it very quickly, or it will simply cycle through the various measurements, which is quite annoying! It is also a “power hungry” little tool. It takes four batteries to keep it going, and they have different sizes, which are 3V coin cell and 1.5V button cells. If the first tool in our list took the principle that these simple tools were ripe for additional functions, this next product takes that same idea and really runs with it! At its heart, we have a fairly simple pressure gauge device, but mounted around it are a range of additional tools. At first look, you would notice that this is a very useful emergency tool since it has a glass smasher and a seatbelt cutter, which are tools that we should all carry in our vehicles so that we can offer roadside assistance if required. The built-in LED flashlight is also handy, both in terms of attracting attention in an emergency situation as well as making the gauge itself easier and more practical to use in everyday life. That, by the way, is also the negative of this device. 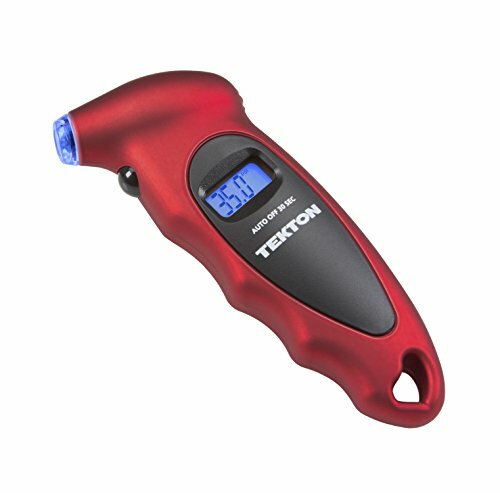 Yes, it is a very useful emergency tool, but its primary function, which is as a digital tire pressure gauge is not as we expected. The truth is that there are simply better tire gauges on the market. It doesn’t, for example, have the accuracy of more premium models and the LCD-type screen is small and harder to read than many other models. Additionally, this is the most expensive item on our list, and a lot of that cost is due to the presence of the extra tools. As we said, it is a great idea to carry a seat belt cutter and glass hammer in your vehicle, but it might be a better idea to buy a cheap emergency tool that provides those functions and invest the rest of your money into a better and dedicated pressure gauge. If you’re wondering what Slime has to do with tires, Slime (with a capital S) are actually a tire accessories manufacturer. 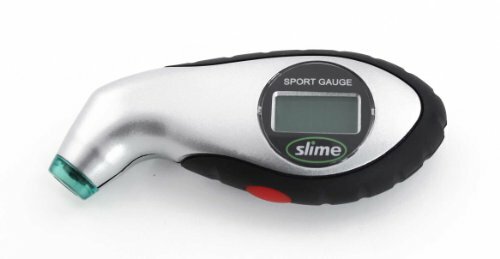 They are most well known for making a slime, an emergency tire repair substance but in addition to that, they also make some tire-based accessories, such as this digital gauge. Despite its premium name, this is the low price, bargain option on our list. It comes with a price at least half the nearest cheapest model. As with many products, when you cut the price, you do lose some of the higher end design points and functionality that are found on more premium models. For example, this model will only measure PSI of the tire. More premium models, as seen above, will offer readouts across a range of measurements, making them a little more useful. While some features are absent, some are actually very impressive especially on a model with this price point. The lighted nozzle tip is a very useful feature that is not found on all digital pressure gauges, so it is great to see it installed here. Ultimately, it is the construction that lets this product down. For one thing, despite being a straightforward device, it is surprisingly large and chunky. That can make it harder than it should be to tuck away in a glove box or tool drawer. There is also an issue with the batteries. It looks like it was originally designed for a single 3v button cell but instead has been loaded with two 1.5v button cells in a circuit. The batteries are also held in place with a tiny screw, making them very hard to change. 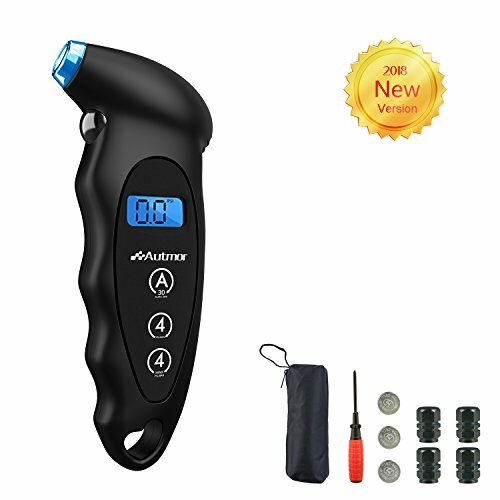 We are going with the Accutire Digital Tire Pressure Gauge as the best digital tire pressure gauge product on our list. Why is this? Well, at the end of the day, we are here to look at the best pressure gauges. Not the best auxiliary torch, not the best multi-tool but the best gauge. It is simpler than many others and does not have the bells and whistles of more complex designs. It is also easy to use, simple to read, very efficient, and long-lasting. It has a reasonable price and does everything it says it will with the minimal amount of fuss.